Al-Haq est une organisation palestinienne de défense des droits de l’Homme. Dans son dernier communiqué, l’organisation revient sur l’incendie criminel perpétré par des colons tuant un bébé de 18 mois et brulant les membres de la famille. Cet acte est l’une des conséquences de l’entreprise coloniale illégale d’Israël et de l’impunité dont jouissent les colons violents. On July 31, 2015, Ali Dawabsha was killed in a settler arson attack against his family home in the village of Duma, south of Nablus. 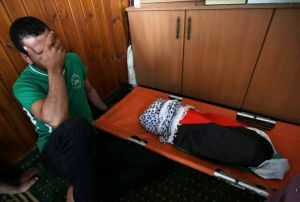 Ali’s parents, Sa’ad Muhammad Dawabsha, 33, and Riham Hussein Dawabsha, 27, and his four-year-old brother Ahmad suffered third and second degree burns. All three remain in the hospital. Their home was completely burned and a neighbouring house was partially damaged. Investigations have revealed that at least two settlers from the nearby settlement of Ma’ale Efrayem broke the windows of Sa’ad’s home and threw firebombs inside. Ali’s tragic death must be considered with the kidnapping and burning alive of 16-year old Muhammad Abu Khdeir by Israeli settlers last year. These deaths also cannot be separated from the torching of mosques, churches, schools, and even olive trees by Israeli settlers. While Al-Haq condemns the attack and murder of Ali, Al-Haq emphasizes that the incident was an expected outcome of Israel’s illegal settlement enterprise and the permissive treatment of violent settlers by Israel and the international community. In a climate where Israel is unwilling to protect the occupied Palestinian civilian population and continues to implicitly support such acts, Al-Haq urges the international community to take immediate measures in order to end the occupation and Israel’s settlement enterprise. Settlements impact every aspect of the lives of Palestinians, ranging from the obstruction of the right to self-determination to the ability of Palestinians to attain their most basic human rights, such as freedom of movement and the right to work. Notably, under international law, Israel, as the Occupying Power, has the duty to ensure the protection of the civilian population, including through ensuring public order and safety. However, as detailed in Al-Haq’s 2013 report “Institutionalized Impunity” almost daily attacks by settlers occur in the Occupied Palestinian Territory (OPT) against Palestinian civilians and their property, and almost all of these crimes are met with effective impunity. As such, the arson attack and killing of 18-month-old Ali is a direct outcome of Israel’s settlement expansion in the occupied West Bank. The Israeli government continues to facilitate the transfer of civilians into the OPT, appropriate Palestinian land to allow for further settlement growth, and turn a blind eye when Israeli settlers attack Palestinian civilians and their property- all in contravention to international law. After this latest attack in Duma, the Israeli media similarly noted that the “police and Shin Bet security service have identified a pattern of predawn attempts to set Palestinian houses on fire, with the intent of burning it along with its inhabitant,” with such attempts beginning in 2013. Al-Haq stresses that a just solution cannot be achieved with settlements present in the West Bank, including East Jerusalem. Given Israel’s failure to combat settler violence in the OPT, members of the international community must take effective measures in order to protect the occupied Palestinian population and bring to an end the illegal settlement enterprise. Third States, in particular members of the European Union, are encouraged to implement travel bans, including visa restrictions, on the entry of settlement leaders and settlers involved in violent acts. Al-Haq further reiterates its call to third states to institute a ban on settlement imports. Israel’s control over Palestinian land and natural resources is primary to sustaining the settlement enterprise and perpetuating the occupation. By permitting settlement goods to enter into their domestic markets, States are implicitly recognizing illegal conduct in contravention to their obligations under customary international law. In total, states must comprehensively evaluate how they may be perpetuating the existence of settlements, and take relevant action to ensure that they are abiding by their international obligations. mohammad_masri_-_gazaLast, Al-Haq highlights that along with settlers, the use of force and violence against Palestinians by state actors is also often met with impunity. Since the murder of Ali, two other Palestinian youths, Laith Al Khaldi and Mohammad Al-Masri, both 17, were killed by the Israeli Occupying Forces (IOF) in the West Bank and the Gaza Strip respectively. These deaths come during a period of an escalation in violence by the IOF, where three other Palestinians have been killed since July 21. Report of the independent international fact-finding mission to investigate the implications of the Israeli settlements on the civil, political, economic, social and cultural rights of the Palestinian people throughout the Occupied Palestinian Territory, including East Jerusalem, Advanced Unedited Version, para. 107.